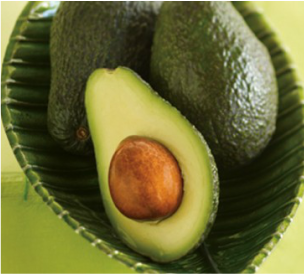 The avocado is believed to have originated in the state of Puebla, Mexico. It is a fruit and is sometimes called an alligator pear. The fruit matures on the tree but ripens off the tree. They should be stored at room temperature and can take 4 - 5 days to ripen. Avocados offer nearly 20 vitamins and minerals in every serving. They have more potassium than bananas and are sometimes called the world’s healthiest food. They are high in monounsaturated fat, which is a “good” fat that helps lower bad cholesterol. Avocados are best known as the ingredient in guacamole. However they can be used in many other ways such as sandwiches, salads, dressings, ice cream and baked goods. Puree all ingredients in the blender until smooth. Freeze in an ice cream machine according to manufacturer’s directions Then freeze overnight. 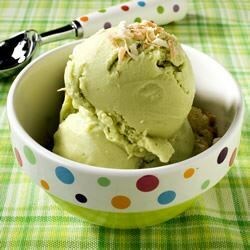 For added flavor ½ can of drained crushed pineapple can be added or chopped pistachio nuts can be added. Preheat oven to 350 degrees. Grease a 9X13 inch baking dish. 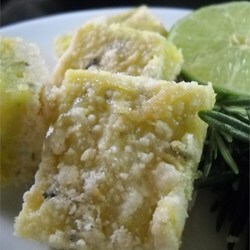 Mix flour, ½ cup sugar, rosemary, and lime zest together in a bowl. Cut butter into flour mixture with a pastry cutter until clumps are small. Set aside 1 cup of the flour mixture for later use. Press remaining flour mixture in an even layer into the bottom of the prepared baking dish. Bake in preheated oven until the crust sets, about 10 minutes. Mix ½ cup of the reserved flour mixture with 1 cup sugar, lime juice, eggs, and mashed avocado in a bowl until mostly smooth. Spread over the baked crust. Top with remaining ½ cup of the reserved flour mixture. Bake in oven until set. About 25 minutes. Cool completely before cutting into 48 bars. Cover with plastic and refrigerate. Mix flour, baking soda, baking powder, and salt in a bowl. Set aside. Beat the butter and sugar with electric mixer in a large bowl until light and fluffy. The mixture should be lighter in color. Add eggs one at a time, allowing each egg to blend into the butter mixture before adding the next. Beat in the avocado and lemon juice with the last egg. Pour in the flour mixture alternately with the milk, mixing until incorporated. Fold in the lavender and lemon zest, mixing just enough to evenly combine. Pour batter into prepared pans. Bake in preheated oven until a toothpick inserted into the center comes out clean. About 1 hour. Cool in the pans for 10 minutes before removing to cool completely on a wire rack. You can also add a can of rinsed black beans with or instead of corn, and/or chopped tomatoes or minced jalapeno for an extra kick! 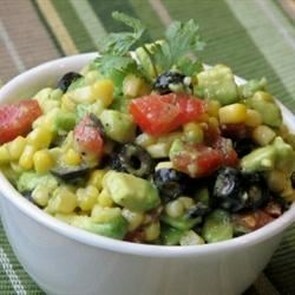 In a large bowl, mix corn, olives, red bell pepper and onion . in a small bowl, mix garlic, olive oil, lemon juice, cider vinegar, oregano, salt and pepper. Pour into the corn mixture and toss to coat. Cover and chill in the refrigerator 8 hours or overnight.